How are leaks in door rubber seals detected? There are few reported incident where the rubber seal on the door was damaged and it took numerous hours to find the cause and then find the location of the damage. I want to know the ways to detect the leaks mostly for the big passenger jets. I am not sure if this can be detected during maintenance checks or even aircraft is in air. Testing the doors (and windows) by pressurizing the cabin eats into the aircraft's pressurization cycles. Instead vacuum is used to simulate the in-flight conditions. A special fabric and a sheet with attachments to hoses are attached to the outside where the door/windows are to be tested. Vacuum is created between the fabric and fuselage, thereby locally simulating an in-flight differential pressure. If the vacuum doesn't hold, it means there is a leak, which can be pinpointed from the inside with sensitive equipment. Pressurized aircraft often leak like sieves once they get older. It's difficult to set limits unless an OEM provides a specific procedure, and an OEM procedure may be designed for new a/c as a quality control measure without any latitude for service deterioration. There isn't really any guidance on leak rates in the FARs for cert purposes. There is only language limiting exposure time for passengers to low cabin pressures for emergency descents, which has an indirect impact on leak rates. Beyond that it's just the ability of the bleed sources to keep the cabin pressurized. From an operational standpoint, a leak will get looked at either when there are pressurization irregularities like a crew writing up a "slow to pressurize" snag of some kind, or when there are complaints about noise or drafts from door seals. 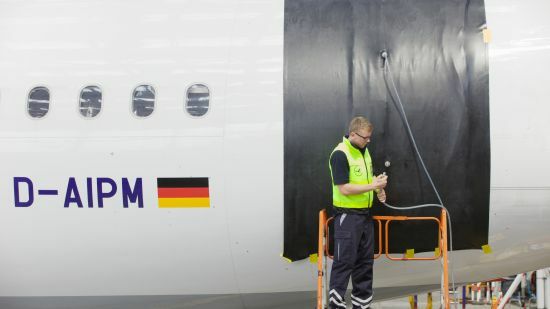 An airline may do a fuselage leak check on a heavy check interval like C Check (typically 5000 hrs) where they will pressurize the fuselage in the hangar (or use a vacuum system as ymb1 mentioned) and go around listening and spraying with a soap bottle. It'll depend on their maintenance program. If there are no service limits for leak rates however, they probably wouldn't do that kind of test if there are no pass/fail limits and will only do it as a troubleshooting exercise. One common way to detect door seal leaks (in aircraft, cars, refrigeration, and so forth) is to (slightly) pressurize the cabin or storage space with a tracer gas and use a detector to look for locations where the gas passes the seal. Obviously, this is easier with a smaller space an/or shorter total seal length, but if the gas is something common and cheap like carbon dioxide, it may be practical for even a full size airliner cabin. Not the answer you're looking for? Browse other questions tagged aircraft-maintenance doors or ask your own question. Do Freon gas leaks occur in Airplane conditioning systems as well? What is this line found above the door on many aircraft? What is this protrusion on the door? Why is the MD-88's front starboard door smaller than its port one? Why does the door slide mode need to be changed after the jetway or stairs are detached? What type of mechanism is used to operate the Embraer EMB 120 front door? What is this door below the lavatory? Why does the PA28 only have one door? Why does Boeing use two different door-types (B757 hinge vs. B767 slide)?